The temple houses Phra Pathom Chedi, the largest pagoda in Thailand. Phra Pathom Chedi is the official provincial symbol of Nakhon Pathom. Wat Phra Pathom Chedi Museum : The museum is located at a lower level in the east of the church. It houses artefacts and historical remains which were discovered during the excavations in Nakhon Pathom including the coffin and funeral ritual set that were used in Ya-Lei’s cremation ceremony. Ya-Lei was a dog very dear to King Rama VI, that was shot and died. The King was much saddened and commanded to building of a monument for Ya-Lei as a token of his grief. The museum is open daily from 09.00-16.30 except Monday and Tuesday. Then there is the National Museum of Phra Pathom Chedi : This is also worth a visit. The National Museum of Phra Pathom Chedi is located to the south of the Pathom Chedi compound. It is a 2 storey modern Thai building that houses artefacts and historical remains, most of which dates back to Dvaravati period and were found during excavations in Nakhon Pathom. 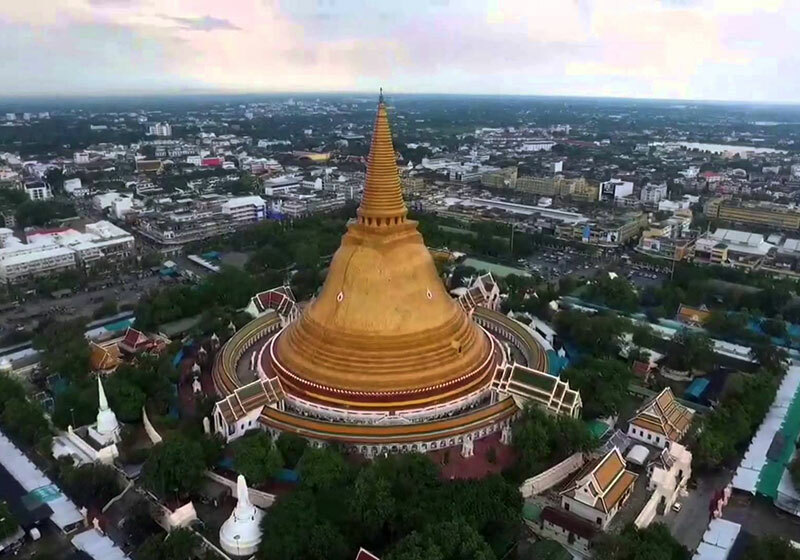 Short Description: Phra Pathommachedi or Phra Pathom Chedi is a stupa in Thailand.The stupa is located in the Wat Phra Pathommachedi Ratcha Wora Maha Wihan, a temple in the town center of Nakhon Pathom, Nakhon Pathom Province, Thailand.